Wolf! is described as an Americana concept album – the story of a 57 year old German music producer who finds his life falling apart when he makes some unwise investments, and his wife leaves him and he has to become a sixties folk revival singer – and finds that his audience just want to mock him. That’s what it says on the inlay card anyway. If one just listened to the music on the album it would soon become clear that there isn’t a single clear tie-up with the concept. There isn’t a single word in German – although ironically there is a little French. Had Wolf! been presented as the musical interpretation of, say, a book – perhaps in the style of The Real Tuesday Weld’s The Last Werewolf – it would make more sense. Only it isn’t. The concept would appear to be all in JP Den Tex’s imagination, for the unguided listener there’s not so much of a concept. So, let’s ignore that aspect from now on. Which leaves what ? Well, Wolf! is a mixture of emotional songs – such as the “our love is falling apart” of Modern Love, some standards – a nice enough but pretty unnecessary version of In The Pines – and some political songs offering a critique of the money worshipping society. 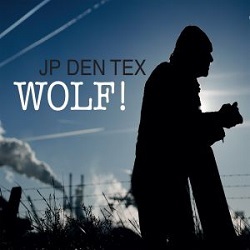 These last are the main meat of the album, and are also the best suited to JP Den Tex’s gruff vocal. The best examples of this are the mid-album pairing of On Days Like This and Money Money (Je M’en Fou). The first of these is an angry protest about spiralling inequality which really bites with its mix of sung and spoken call and response “Some folks have a lot (that’s about 1% of the people) / Some folks have enough (that’s about 39% of the people) / Put together they possess 99% of the world’s riches / Which leaves the rest of us fighting over the remaining 1%”. It’s a true protest song – direct and powerful. Money Money (Je M’en Fou) is a gentler, reflective take on the rat race and trades relentless capitalism for humanity “We are more than what we own / Heart of gold or heart of stone”. Another standout track is Beatnick Americana, it’s a list of influences and heroes from William Burroughs to Willy Nelson, taking in Bob Zimmerman and The Big Bopper along the way. It’s got a bit of a feel of Eric Andersen about it – that’s a good thing for certain. Wolf! is an album that when it’s good is truly good, and when it’s not it’s not truly poor, just disappointing alongside the better stuff. Mixed messages and false directions on an album where politics and protest are shown to be the artist’s strongest hand.